This past week while working in Fort Collins, Colorado, my collegues and I decided to have a dinner at the Canyon Chophouse. You may recall, I had eaten at the Rodizio Grill the week before, and unfortunately had a pretty bad experience, so we needed a different place to eat. The reviews of this restaurant led me to believe this was a successful dinner in the making. Finding the restaurant was somewhat like running the labyrinth though. It was buried on an odd street near old town Fort Collins, which makes sense, as the restaurant is an old bank building. We arrived early though, and parking was great, however, our initial reception was not. The lady at the front desk asked if we had reservations, which we did not, and she hesitantly said she thought she could get us in. Then we waited, and waited, and waited. It was hard to understand why, as the restaurant was nearly empty. Had we had another alternative nearby, we probably would have left. Even so, as we stood there talking, we started noticing people coming in, which led us to believe the restaurant would soon be full. 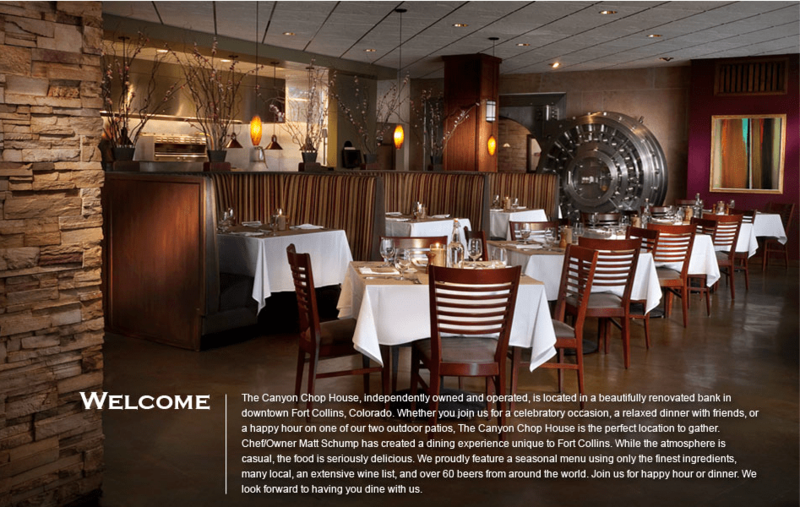 An image from Canyon Chophouse’s website showing the vault in the background. When we finally were seated, my high hopes for the restaurant had settled to a mere simmer. It wasn’t long until this changed though. The lady who seated us alse ended up being our waitress, though I cannot remember her name. She was very attentive from this point forward, and quickly overcame my earlier hesitation. The menu seemed robust enough, though I have to admit, I immediately knew what I would eat: a bone-in ribeye. And wow, was it good. Honestly, this was probably the best steak I have ever had, and that says a lot. It was tender, flavorful, juicy. WOW. The sides were a different story though. I had asparagus, which was good, and sauteed spinach. The spinach was the real disappointment, as it had been cooked in so much alcohol that it was almost inedible. In fact, I didn’t eat it. Even so, the steak. Wow, the steak! Mmmmm! This entry was posted in Review and tagged in canyon chophouse, canyonchophouse, ribeye, rodizio grill, steak.